BUFFALO, NY (April 27, 2018) --- Western New York Flash head coach Matt Waddington and his staff has announced three key players to the roster with just weeks before the start of the 2018 United Women’s Soccer season. 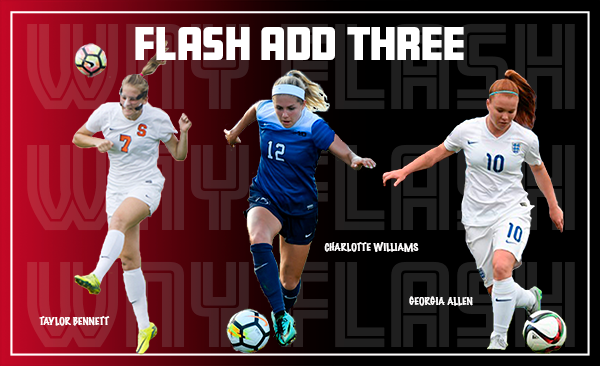 The additions of Georgia Allen, Taylor Bennett and Charlotte Williams will help push the organization towards their goal of competing for the UWS Playoffs. Allen, a native of Suffolk, England and student at Syracuse University, brings international experience to the roster and be competing for England’s U-20 National Team at the U-20 World Cup in August. Allen has also logged minutes for England’s U19 squad and served as the captain of England’s U17 team. Bennett, a native of Ithaca, NY, also plays for Syracuse University and has competed with the U-18 United States National Team and was named a First-team All-State Selection in four of her six years at Dryden High School. Williams, a native of Rochester, NY, was a third team All-B1G player for Penn State and has played for the U-23 United States National Team after being selected as a four-time All-State Class A honoree at Brighton High School.